Robert Wallace McDonald Jr. passed away in the early hours of September 22, 2018 at his home in Lockhart, Texas. He leaves his wife of 62 years, Angela Rayburn McDonald, his sons Robert W. McDonald III and Jon S. McDonald and his wife Robin, his daughter, Mary Elese McDonald, Grandsons R.W. McDonald IV and his wife Alex, Zack McDonald and fiancé Kylie, a granddaughter Emily Ann McDonald and two Great-grandchildren , Robert W. McDonald V (Mac) and Logan McDonald. He was preceded in death by his only sister, Ann McDonald Berryhill of Pontotoc and her husband, Farrell. Bob was born in Pontotoc , MS on April 4, 1934 to Robert W. McDonald and Mary Salmon McDonald. After graduating from Pontotoc High School, he attended Mississippi State University, graduating in 1956. He was active in his fraternity, Sigma Alpha Epsilon. He was a devoted bulldog fan and attended many baseball and football games throughout his life. He was at times, cowbell crazy! 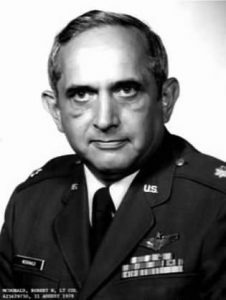 After graduating from MS State, Bob was commissioned into the United States Air Force. As a young, recently trained 2nd LT., Bob had the privilege of serving on President Dwight Eisenhower’s flight crew on a mission to Turkey. He was loved and respected by his peers and mentored many people over his long career. He had a distinguished 30 year career advancing to the rank of Colonel when he retired. He later was honored to serve as President of the Texas Reserve Officers Association. A meticulous planner, Bob took his family on many vacations. We have many cherished memories of five of us in the car barreling down one highway or another. Later in his retired life, Bob and Angela traveled extensively all over the world. They also enjoyed their trips with the Mississippi Seniors golf association. As the head of a large and loving family, he was admired, loved and respected by his wife, children and grandchildren – a legacy we know he is most proud of. Family, faith and community were the tenets Bob lived his life for. No one has done it better. He will be missed. In lieu of flowers please consider donating to The Texas Paralyzed Veterans of America (texaspva.org), Presbyterian Children’s Homes and Services (pchas.org), Mississippi State University Foundation (msufoundation.com) or Martindale United Methodist Church (martindaleumc.org). The viewing with the family was from 11am-12pm Tuesday, September 25th at Pennington Funeral Home in San Marcos, TX with a memorial service at Martindale United Methodist Church in Martindale, TX at 1pm. There will be a small graveside service at 10:30 am, Thursday, September 27th, in Pontotoc, MS at the Pontotoc Cemetery.